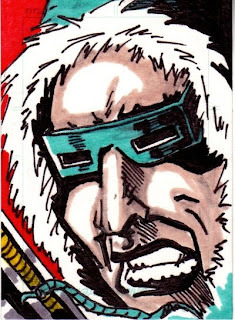 Taylor's Sweet Little Art and Nerd Site: Sketch Card of the Day- Captain Cold! For a while, I'll be posting some older art from my archives. I really should get that work on the site and it will help for postings as I finish up a big comic project for Gradient Comics. Today's Sketch card is Captain Cold. Captain Cold made his first appearance in May of 1957. He is a DC villain and namely one of the Flash's. I had never heard of Captain Cold until Mattel made an action figure of him in the DC Classics collection. He was part of a big build-a-figure toy wave and when I saw him, I couldn't resist getting him in my collection. This sketch card is based on that action figure. You can also see this sketch card in my deviantart gallery here. I'm scheduled to be on the DELol show on Sunday July 21st to have a good old fashioned "Throw down in the toy isle" toy quiz compatition between Jeff and I. You need to tune in to the DELol show that Sunday. It will be fun!